Industry experts dole out advice on how best to prepare for a major system overhaul. Paperless offices. Instant access. Electronic records. Not too long ago, these were little more than amusing catchphrases bandied about at conferences by medical technology professionals claiming to have seen the future. Few believed they would become a reality or that electronic health information management would be seen as a competitive advantage. Today, healthcare organizations of every size are reordering their priorities and reexamining their health record processes with a key goal in mind: to embrace the best EHR adoption strategies in order to streamline their HIM systems. Here’s one thing we know: HIT is in a constant state of limbo. This reality, coupled with the ever-changing nature of the EHR within hospital environments, is changing the face of patient record documentation as we know it. The complexity of EHRs and the speed at which the technology changes is perhaps the biggest factor driving the need for evaluating EHR adoption. Hospital administrators now realize that researching, testing, and observing other facilities that have adopted EHRs is the key to getting the most out of their potential investment. Vreeland typically recommends that hospitals or healthcare systems use a structured approach that removes as much subjectivity from the process as possible. “Our approach when working with clients is to build a process that is requirements based and involves as many areas of the hospital as possible to ensure that there is significant buy-in to the ultimate vendor decision,” he says. It should come as no surprise that an EHR implementation may have a significant impact on a healthcare organization’s workflow and processes. CompTIA’s Second Annual Healthcare IT Market: Insights and Opportunities study found that among practices with EHRs, many were underutilizing features. Additionally, the research confirmed that many healthcare professionals seek additional training in the usage of their EHR system. Of course, testing and training options vary. The EHR vendor or the IT solution provider involved in the implementation may provide it. If it’s a large hospital or health system, testing and training may be handled internally. By working with clinicians, managers, and staff to document functional and nonfunctional requirements and then structuring an evaluation process that involves a number of representatives from the organization, Cumberland Consulting Group has found that a hospital can make an informed decision about the vendor that is best for that hospital’s particular situation. To help in the EHR adoption process, HIMSS has compiled a variety of materials that cover EHR adoption strategies. Most recently, the organization released its Electronic Health Records Workflow and Implementation Challenges Checklist for HIMSS members to utilize during their EHR journey. Likewise, the National Institute of Standards and Technology recently published new publications that offer technical strategies and tactics for improving EHR usability and accessibility. Other sources of information to help shorten the list of possibilities include industry trade shows or conferences. Experienced IT solution providers who work with a number of EHR vendors also can discuss the range of options. Some EHR systems that are software-as-a-service based offer free trials, which is a good way to test the waters and find a suitable vendor that fits organizational goals. Only an Internet connection is needed to try these applications. It is also helpful to have a person in-house who has a solid view of the vendor marketplace so that the intial “long list” can be constructed. In many cases, this kind of experience can be found through working with a consulting group. Once a healthcare organization decides what resources it will use to narrow the field of contenders, what attributes will factor into the final decision? Vreeland says it is highly dependent on the current situation and the organization requirements. For example, he worked with a client that had been operating a custom-coded patient accounting system for many years. 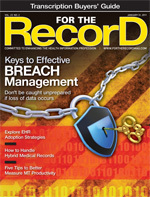 There are numerous best practices surrounding EHR adoption. Vreeland believes it’s important to understand an organization’s goals and objectives and to gather requirements from a broad group of departments to properly select a new information system. Communicating the reasons for change, ensuring involvement in the design of future processes by the individuals most affected, and providing flexible training and support on the new workflows and supporting systems will help significantly. Facilities must also be willing to remain adaptable and work through any hiccups that may occur in the early stages of EHR implementation. Finally, facilities should regularly review and assess what is working and what’s not. Involving users in the adoption process is paramount. Just as Vreeland recommends putting in place an efficient strategy that utilizes significant numbers of individuals from the organization, he believes in the involvement of end users throughout the system implementation life cycle. With respect to clinicians, many of the same theories apply. However, with busy physicians and other providers, it’s important to fashion ways to involve them that take into consideration their hectic and often erratic schedules. According to Vreeland, the biggest challenge in adopting EHRs is typically moving to advanced inpatient clinicals, which requires physicians to enter their own orders and do their own documentation. CompTIA research suggests the greatest pushback comes from the perceived impact on workflow or processes. In the survey, EHR users suggested several ways to improve EHRs, including making the technology faster, easier to use and less complex, and more capable of achieving interoperability with other systems. • limited involvement of the end user community in design, testing, and training. • failure to invest in adequate staff training. Should meaningful use be a driving force or a natural result of EHR adoption? From Vreeland’s perspective, it should ideally be both.